The archaeologists from the Regional Museum of History in the northern Bulgarian city of Veliko Tarnovo will receive only a small portion of the government funding that they had requested for their 2015 summer excavations of six major archaeological sites. They will get from Bulgaria’s Ministry of Culture just BGN 33,000 (app. EUR 16,800) which is to be spent on excavations of only three archaeological sites, reports the Bulgarian daily 24 Chasa. The report adds that the list of sites approved for government funding for archaeological research for the 2015 summer season is to be uploaded to the website of the Bulgarian Culture Ministry within a couple of days. The Veliko Tarnovo archaeologists had asked for a total of BGN 175,000 (app. EUR 90,000) in government funding in order to carry out excavations of 6 major archaeological sites in the region: the prehistoric settlement near the town of Hotnitsa, Veliko Tarnovo Municipality; two prehistoric mounds near the town of Petko Karavelovo, Polski Trambesh Municipality; the Ancient Roman city Nicopolis ad Istrum near the town of Nikyup, Veliko Tarnovo Municipality; the Trapesitsa Hill in the medieval Bulgarian capital Tarnovgrad; and a previously unknown monastery discovered in 2014 at the foot of the Tsarevets Hill (Trapesitsa and Tsarevets were the two main fortified hills of medieval Tarnovgrad). 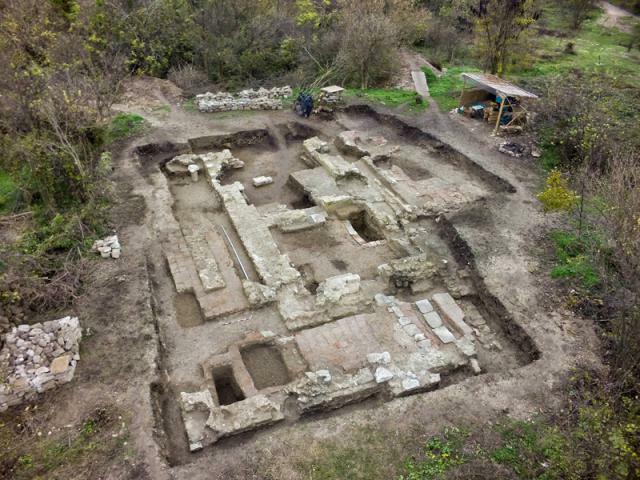 Now with the meager government funding, the Veliko Tarnovo archaeologists will be able to excavate further only the Roman city Nicopolis ad Istrum, the medieval Bulgarian monastery discovered at the foot of the Tsaravets Hill in 2014, and one of the prehistoric settlement mounds in the town of Petko Karavelovo. The prehistoric settlement in Hotnitsa, and one of the mounds in Petko Karavelovo, as well as the Trapesitsa Hill in Veliko Tarnovo will not be excavated in the 2015 summer season. Of the total funding from the Bulgarian government amounting to BGN 33,000, BGN 15,000 (app. EUR 7,700) will be spent on excavations in the Ancient Roman city of Nicopolis ad Istrum near the town of Nikyup. However, this funding will be suffice for the excavation of just a one sector of the archaeological preserve where Assoc. Prof. Pavlina Vladkova will continue the exploration of a huge public building north of the city forum which housed the tax bureau of the Ancient Roman city. “The sum we need is almost BGN 40,000 (app. EUR 22,400). With the [allocated] funding, we will now be able to work for just one month with 10 workers," she is quoted as saying. The head of the Veliko Tarnovo Regional Museum of History Ivan Tsarov will not be able to excavate further the water supply and sewerage system of Nicopolis ad Istrum because the Bulgarian Culture Ministry has not approved his request for BGN 25,000 (app. EUR 12,800) in state funding. Prof. Hitko Vachev, who made one of the major archaeological discoveries in Bulgaria for 2014 by unearthing a previously unknown medieval Bulgarian monastery of the House of Asen (Asen Dynasty) at the foot of the Tsarevets Hill, will get only BGN 12,000 (app. EUR 6,100) for his 2015 summer excavations. He had asked asked for BGN 30,000 (app. EUR 15,300) in government funding. In 2014, during his digs at what was the large monastery church with dimensions of 18 by 10 meters, he discovered the funeral of a Veliko Tarnovo metropolitan from the Middle Ages, the stone tomb of a maid of honor from the Bulgarian imperial court, and grave of a Bulgarian aristocrat and military commander from the 13th-14th century AD. The artifacts he found there included massive gold earpieces, a gold male earring, 40 gold buttons, and remains of gold-lace clothing meaning a clear connection with the Bulgarian imperial court at Tarnovgrad (Veliko Tarnovo). The remaining BGN 6,000 (app. EUR 3,300) of approved government funding for the archaeologists from the Veliko Tarnovo Regional Museum of History will be spent on excavating further the Chalcolithic settlement mound in the town of Petko Karavelovo. The prehistoric settlement mound in Petko Karavelovo has been excavated since 2009 by archaeologist Alexander Chohadzhiev who has discovered there 6,500-year-old two-story homes the Chalcolithic (Aeneolithic, Copper Age) and prehistoric children’s toys, among other artifacts. Its ruins are located near today’s town of Nikyup, Veliko Tarnovo Municipality, 18 km northwest of the city of Veliko Tarnovo in Central Northern Bulgaria. Its name means “Victory City on the Danube River". It was founded by Roman Emperor Marcus Ulpius Traianus (r. 98-117 AD) to honor his victories over the Dacian tribes between 101 and 106 AD (most probably in 102 AD) on a plateau on the left bank of the Rositsa River. This is where the two main roads of the Danubian Roman provinces intersected – the road from Odessus (Odessos) on the Black Sea (today’s Varna) to the western parts of the Balkan Peninsula, and the road from the Roman military camp Novae (today’s Svishtov) on the Danube to the southern parts of the Balkan Peninsula. The Ancient Roman city Nicopolis ad Istrum was destroyed in 447 AD by the barbarian forces of Attila the Hun, even though it might have been abandoned by its residents even before that. It was rebuilt as a fortified post of the Eastern Roman Empire (Byzantium) in the 6th century AD. The Early Byzantine fort covered one about one forth of the Ancient Roman city – 57.5 decares (app. 14.2 acres) out of a total of 215.5 decares (app. 53.2 decares), and was also the center of a bishopric. The Early Byzantine fort was destroyed at the end of the 6th century AD by an Avar invasion. Later, it was settled as a medieval city in the Bulgarian Empire between the 10th and the 14th century. Nicopolis ad Istrum was visited in 1871 by Austro-Hungarian geographer and archaeologist Felix Kanitz who found there a statue of the wife of Roman Emperor Septimius Severus (r. 193-211 AD). The city was first excavated in 1900 by French archaeologist J. Seur whose work, however, was not documented, and in 1906-1909 by Czech-Bulgarian archaeologist Vaclav Dobruski. In 1945 and 1966-1968, there were partial excavations led by T. Ivanov from the National Institute and Museum of Archaeology of the Bulgarian Academy of Sciences. Systematic excavations were started in 1970 and were led again by T. Ivanov. Between 1985 and 1992, Nicopolis ad Istrum was excavated by a joint Bulgarian-British expedition from the National Institute and Museum of Archaeology in Sofia and a team of the University of Nottingham. The joint Bulgarian-British excavations were resumed in 1996. The Nicopolis ad Istrum archaeological preserve is managed by the Veliko Tarnovo Regional Museum of History. In 1984, the Ancient Roman city Nicopolis ad Istrum was put on the Tentative List for consideration as a UNESCO World Heritage Site.